Mercedes-Benz Sprinter Performance, Engine, Ride, Handling | What Car? With a range of engines ranging from 111bhp to 187bhp, the Sprinter has more power than both the Ford Transit and Volkswagen Crafter. We’re not talking huge amounts, but on base level vehicles it’s the equivalent of 10% more power. The 2.1-litre engine is the same unit that has been used in the Sprinter van since its upgrade to Euro-6 engines in 2014. But that doesn’t mean Mercedes hasn't made some improvements. There’s a slight bump in power for the two lower power outputs, and if you’re interested in buying a Sprinter as a camper van there’s a 177bhp option not available to van customers. The 3.0-litre V6 diesel, meanwhile, remains unchanged with 187bhp. But which engine should you be looking to get in your Sprinter van? Well, with 111bhp, the Sprinter has the most powerful entry-level engine, bettering the 109bhp engines found in the Renault Master, Peugeot Boxer, Citroën Relay, Fiat Ducato, Nissan NV400 and Vauxhall Movano. It wouldn’t, however, be our choice and nor would the 143bhp unit. No, instead we would recommend the 163bhp 2.1-litre unit, unless you really need the raw power and torque of the much gutsier V6. Official fuel consumption figures show that the 163bhp unit matches the 143bhp engine with 35.8mpg on a 3.5-tonne panel van, which is better than the 34.9mpg claimed by the 111bhp unit. But our choice isn’t based on fuel economy alone, because the more powerful engine is far smoother and easier to drive. In such a large vehicle like the Sprinter the additional power from the higher output engine is entirely justified and makes for a far more relaxing experience. It’s also available in front, rear and four-wheel drive formats, so regardless of your needs you can choose that engine. The rest of the package is everything you’d expect from a Mercedes-Benz van. The steering is heavy, but exceptionally well balanced. 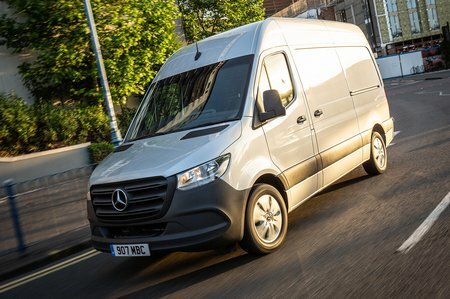 The Sprinter sails around corners with astonishing levels of grip and composure, while it also eats up the motorway miles in fantastic comfort. 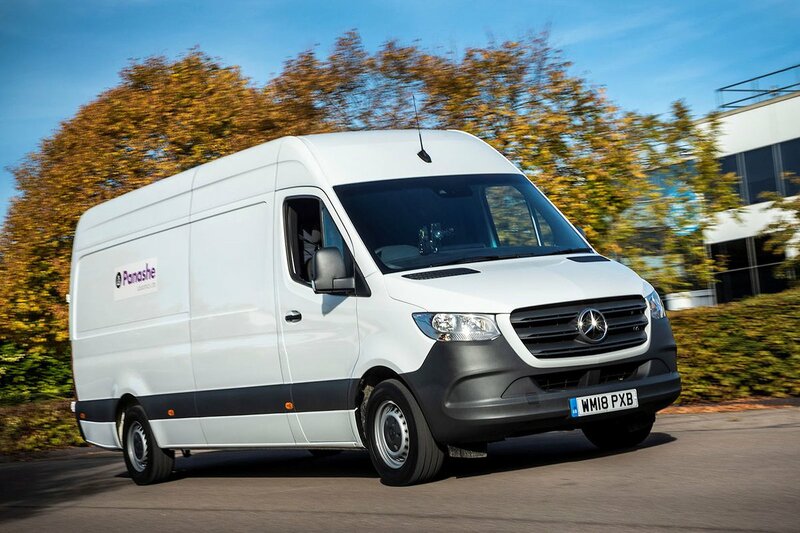 With each incremental change to the Sprinter van it becomes a more complete package, and while the Volkswagen Crafter has arguably a more comfortable ride, the Sprinter is still a top-notch van. The six-speed manual gearbox is well paired to all the engine options, and as such there’s little need to opt for the nine-speed automatic. If you do need a automatic gearbox, however, the 9G-Tronic is a smooth unit that responds quickly to kickdown requests and seamlessly shifts up and down through the gears. Our biggest gripe is with one of the safety features that has been introduced to make the van even better. Along with Adaptive Cruise Control, Lane Keeping Assist is a safety feature designed to make motorway miles, in particular, much easier and safer. Yet, in the Sprinter lane keeping is corrected through the use of the brakes rather than the steering. The net result is severe breaking on the opposite side of the vehicle to the direction you’re straying in which prevents you leaving the lane. The downside is sometimes a significant reduction in speed which can startle other drivers, but in the Sprinter’s defence, Mercedes says the drastic braking is in fact to startle the driver to make sure they adjust their driving wayward driving.